This article first appeared as “Code Red” in the Winter 2014 issue of Ottawa Magazine. Visit our Facebook page for more photos of this project. “Small and large, there are 500 decisions in this kitchen,” says designer Gerhard Linse. The statement is meant to be accurate, not boastful, and serves to highlight just how many choices were made during the lengthy design process. 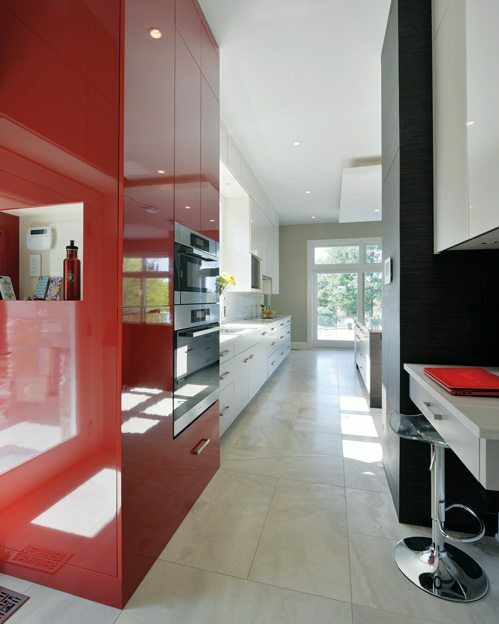 On the visual side, the kitchen is unfussy — pared-down and practical, with just the requisite amount of red cabinetry to punch up the cool grey and white tones that dominate. But a closer look quickly underscores the depth of thought that went into achieving the understated aesthetic. The custom cabinetry comes in three shades (antique white, pepper dust grey, and red) and two finishes (high gloss in the show areas and textured lower gloss in the high-traffic areas), while the dark toasted oak accents help to ground the room. That toasted oak is a new product, the wood heated to extreme temperatures to produce a rich dark shade. 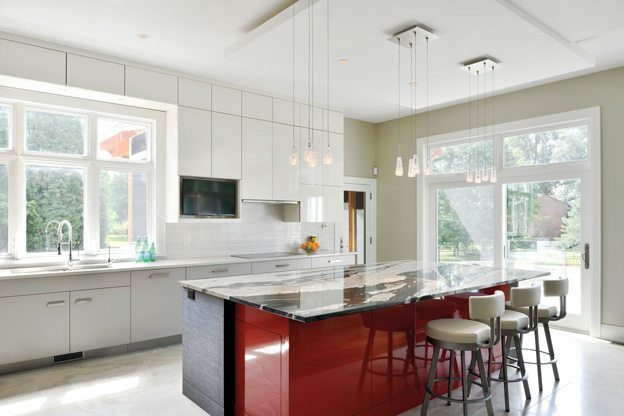 All that sleekness is tempered with fun — 12 pendant lights introduce just the right touch of bling, while a floating ceiling hides strips of LED lighting that can cast a red, blue, or green glow over the room at the touch of a button. Still, this is not simply a show kitchen. It is a central hub for a busy family of five, open to the dining and living rooms as well as to a spacious backyard deck and patio. 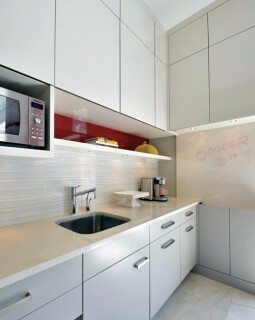 Practical features include easy-to-clean porcelain floors and stainless-steel kickplates under the counters. A textured backsplash, in shimmering tile that doubles as art, continues along the entire wall behind the stovetop. untidiness of day-to-day life. This is where the groceries get carried in and put away and the school lunches get made. And it is in this “mini-kitchen” that Linse has incorporated the tiny touches that make doing chores just a little less tedious. Here we find a well-organized recycling station, a cookbook shelf, and a high-gloss cabinetry panel that is used as a whiteboard on which to write grocery lists and busy family sports schedules. This is where the routine tasks get done in style. Five hundred decisions, hours of sketching and consultation. The net result? A bright and cheery kitchen that is perfectly set up for its role as gathering spot and activity centre — and a room that makes mealtimes just that much more pleasurable. Visit our Facebook page for more photos of this project.